Here at Markwell Glass, it is our duty to provide you with the best conservatories we can offer. We have been installing from start to finish in the Hertfordshire and Essex area for years now and have many years of experience to ensure that all our conservatories are built to the specified standard you would expect with us. Our company does our best to always surpass all your needs and expectations of what you would like with your conservatory. We are based in Bishops Stortford and have a vast knowledge on the conservatory trade. We take great pleasure in providing our customers with the best service available. Our main types are Three Sided Victorian or the Five Sided Victorian Conservatory. These designs give you many advantages such as; with the Three Sided Victorian conservatory, it will allow you to have an elegant design that complements your home all year round. The difference between the Three Sided and the Five Sided is the Five Sided gives you a greater space in the conservatory over the Three Sided. We can do any shape and size conservatory in any design from base to completion, including electrics, heating and plaster to all internal walls. Roof types include; solar reflective glass roofs, poly carbonate roofs and frames in virtually any colour and in any product, all designed with the expert help and advice of our conservatory designer. 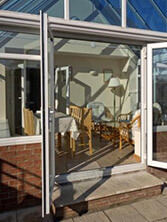 We can also relay patios or construct new patios to compliment your conservatory. So overall, why go anywhere else for all your conservatory needs. It is always our aim to make sure we are providing you with the best products at the best prices. So you can rest assured here at Markwell Glass, we are here to provide you with the best service possible.